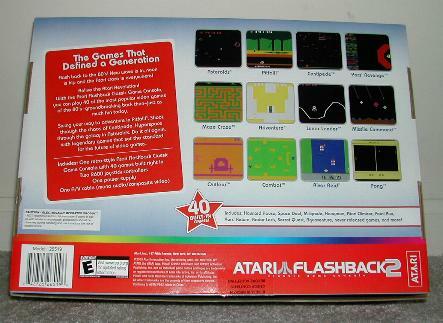 The original Atari Flashback system re-introduced a collection of first-generation video games in a "throw-back" miniature console. Too bad it was a piece of garbage! After that mess, I'm relieved to see this completely redesigned second edition. Not only does the Flashback 2 mimic the look of the beloved Atari 2600, but twice as many games are built into it - 40 in all. Best of all, these aren't the poorly emulated or rewritten versions like we saw in the first Flashback. 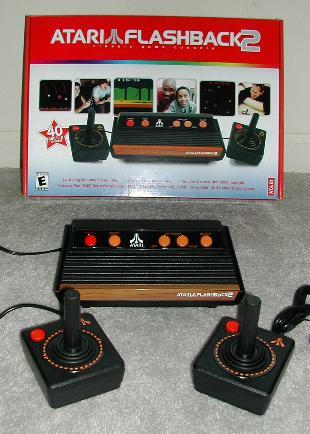 No, this console packs real Atari 2600 hardware, allowing it to run the games exactly as they were intended. 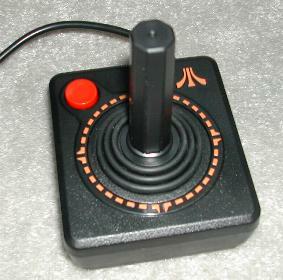 Apparently Atari consulted with classic game experts when designing this system, and it shows. Heck, even the box resembles the Atari of old, depicting people of all ages huddled around the television screen and appearing to have the time of their lives. 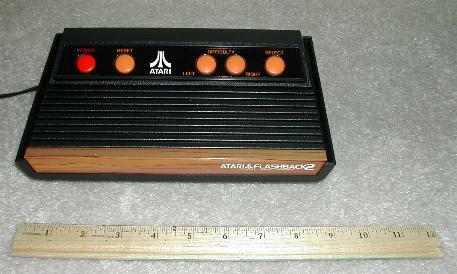 The Flashback 2 console itself measures about 5 by 8 inches, which is tiny compared to the original 2600, but still almost twice as big as the original Flashback. Its appearance more or less assumes the shape of the classic console, right down to the distinctive fake wood-grain trim on the front. Unfortunately, instead of using switches on the front control panel, cheesy-looking orange buttons have been substituted. From left to right, these buttons are power, reset, left difficulty, right difficulty, and select. The layout of these buttons is somewhat unappealing. A small black-and-white/color switch resides on the back side, but that should have been placed on the front to balance out the other controls. My main criticism concerns the difficulty switches themselves. Apparently these have "in" and "out" settings, but you can't distinguish the two by looking at them, and it's even hard to tell by feeling them. I sure wish they would have used old-fashioned silver switches instead. If you're trying to recreate the look of a classic console, why just go half-way? The back of the unit has two controller ports, but while they look like the original ports, they don't accommodate old controllers very well (although in theory they are compatible). The television cable has a yellow and white RCA plugs which provide a level of clarity that the original system could never produce. That's a major bonus. Perhaps the most pleasant surprise is the joysticks. They are shaped almost exactly like the original models, but are better constructed and more durable. But despite having the same style of plugs as the old controllers, you will have a difficult time attaching these to a vintage 2600 system. Naturally, the most important aspect of any system is its games. There's a nice selection of old favorites represented which look and play just as well (if not better) than you remember. Flashback 2's menu screen categorizes the games by Adventure Territory, Arcade Favorites, Space Station, and Action Zone. Many of the game are true classics, but what's truly surprising is the inclusion of unreleased titles I've never even heard of. Some are welcome sequels to old favorites including Adventure and Haunted House. The first game in Adventure Territory is Adventure, an old standby featuring dragons, castles, mazes, and randomly-placed objects. If you enjoy that (and why the hell wouldn't you? ), you'll like Adventure 2, which incorporates a whole new set of screens. Haunted House is less interesting but still enjoyable, and I was shocked to see it has a sequel, Return to Haunted House. Surprisingly, it uses the Adventure engine - to good effect. Secret Quest is a sophisticated space adventure released in the late 80's that hasn't aged as well. Wizard is a confusing maze shooter which I had never heard of, and didn't find particularly playable. The Arcade Favorites category kicks off with "Arcade Asteroids", which is the original 2600 Asteroids with "enhanced graphics". Specifically, the objects are hollowed out to appear more like the arcade. Arcade Pong is another unexpected title, and it's good-looking but unspectacular. Asteroids Deluxe replaces some of the rocks with odd-looking shapes, but excessive flicker and graphical glitches render it unplayable. The 2600 version of Centipede won't win any awards for graphics (almost everything is an orange block) but its frantic gameplay is faithful to the arcade. Lunar Lander resembles an old Apple II game, and while it has a place in video game history, it failed to hold my attention. Like Centipede, Millipede manages to be madly addictive despite its blocky visuals. Missile Command's colorful stages and distinctive sound effects conjure fond memories, although a few extraneous artifacts are present on the screen. Space Duel is another Asteroids clone plagued by graphical glitches. Battlezone rounds out the category with some surprisingly solid first-person shooting action. The Space Station section begins with Caverns of Mars, a mediocre shooter I had only played previously on my Atari 8-bit computer. Next up is the ultra-rare Quadrun which is famous for being the first 2600 game with voice synthesis. Upon starting a new game, you'll hear "Quadrun Quadrun Quadrun!" Unfortunately, its shoot-and-catch gameplay is downright awful. Sabateur was a "never before released" title from the original Flashback, but this version is infinitely more playable. It's a surprisingly complex title with three distinct stages. Space War is a simple two-player shooter that hasn't aged well at all. Yars' Revenge is an old favorite featuring huge explosions and impressive sound effects. I was psyched to see a game called Yars' Return on the list, but this game did not function properly. The Action section is loaded with old stand-bys like Combat, Dodge-Em, Maze Craze, Human Cannonball, and Outlaw. Pitfall and River Raid are the two lone Activision representatives, and frankly, they are probably the two best games of the package. Aquaventure is an interesting underwater shooter, and Combat 2 is an innovative sequel to the original 2600 pack-in game. Atari Climber is not Crazy Climber, but instead a generic ladder game. Fatal Run is a confusing combat/racer that was previously only released in Europe. Frog Pond (not Frogs and Flies) features attractive graphics but shallow gameplay, and the game doesn't seem to end. Off The Wall attempts to update Breakout, but despite its flashy graphics, the gameplay is actually a step down. Radar Lock is a nice first-person airplane shooter, and Save Mary is a very rare title that I couldn't seem to figure out. Rounding out the category are a few old relics: 3D Tic-Tac-Toe, Hangman, Video Chess, and Video Checkers. As you can see, there's a fair cross-section of games but it's still only a fraction of the Atari 2600's extensive library. Conspicuous in their absence are old favorites like Enduro, Berzerk, Keystone Kapers, Space Invaders, Defender, and Ms. Pac Man. Still, the never-before-released titles will interest collectors. I was curious to know where most of these originated, but sadly, no background information is provided for any of these games. In fact, the instruction manual only contains a short blurb for each game. It doesn't even explain the control schemes or game variations! Considering the significant historical value contained here, this is a major oversight.